In addition to the interactive installation described in the UCS manual [ucs-handbuch], profile-based installation of UCS is also possible. In this method, the settings for the UCS installer are specified in a profile file. If all the required settings are included in the installation profile, it is possible to perform the installation fully unattended. Section 1.3 describes the structure of the profile file and the variables used in it. Installation from a DVD: The profile settings can then be imported from a floppy disk or a USB storage device or alternatively stored on the installation DVD. How to perform a profile-based installation from a DVD is described in Section 1.5. The Univention Net Installer can be used to perform network-based installations automatically via PXE. The profile settings used are identical. The PXE-based installations are documented in Section 1.4. Multiple values for one variable are separated by blank spaces. Lines are commented out with #. It is not necessary to write an installation profile from scratch every time: The settings performed in the Univention Installer are saved in the file /etc/univention/installation_profile (with the exception of the root password). This file can be used as a template for an installation profile. Note that the partitioning information from that file is hardware specific and probably needs to be specified as documented in Section 1.3.6. The following installation profile installs a master domain controller with English language and country settings on which the complete hard drive is managed in an LVM. Samba 4 is installed. Additional templates are included on the installation medium in the directory profiles/. The following profile variables are used to control the progress of the installation. For example, it is possible to include a password prompt, run programs before and after the installation or allow the entry of the value for individual variables during the installation. profile_password Here one can specify the password that must be entered when the installation profile is used. This is not a security feature as the password is saved in the profile in plain text. However, a password can serve as a safe guard mechanism against an incorrectly selected profile. to_check Here one can specify variables whose values must be entered or checked at the beginning of the installation. These variables can be used to install a large number of computers of the same type with the same profile in cases where only individual settings such as IP addresses and the computer name are different. If more than one value is specified, the values are separated by blank spaces. check If this variable is used, only the variables listed are requested. Other missing variables are not taken into account. check supports the parameter all. When check=all is used, all profile variables are requested, even those already set (same as interactive installation). If more than one value is specified, the values are separated by blank spaces. scan This option provides mechanisms with which the values of the profile variables can be retrieved dynamically during the installation. At present, hostname is the only profile variable supported. If scan=hostname is entered, the computer name is procured via the computer's IP address by means of a name server request during the installation. scan supports the parameter all. If scan=all is used, all the profile variables supported by scan are imported during the installation. If more than one value is specified, the values are separated by blank spaces. ignore The value for the ignore option can include profile variables that are not to be checked. If, for example, scan=hostname is set, ignore=hostname must also be set. ignore must also be used if system settings are to be set using scripts preinst_hook, postinst_hook). ignore supports the parameter all. If ignore=all is used, no profile variables are requested unless they are specifically set. If more than one value needs to be specified, the values must be separated by blank spaces. cdrom_device The device used to provide the packages during installation, which is normally auto-detected. It can either be a local CD-ROM or DVD device (e.g., /dev/cdrom) or an NFS share (e.g., nfs:192.0.2.2:/var/lib/univention-repository). premount_hook Here one can specify scripts which should be run before the UCS system is boot-strapped. The scripts must be provided in the directory script/ on the installation medium. If more than one script is entered, they must be separated by blank spaces. preinst_hook Here one can specify scripts which should be run before the installation of role-specific packages begins. The scripts must be provided in the directory script/ on the installation medium. If more than one script is entered, they must be separated by blank spaces. postinst_hook Here one can specify scripts which should be run after the installation but before the final update process. The scripts must be provided in the directory script/ on the installation medium. If more than one script is entered, they must be separated by blank spaces. auto_reboot The system is automatically restarted after the installation if the parameter is set to true or yes. This parameter should only be used in network-based installations in combination with the installation_feedback_host, as the computer setting (Re-)install on next boot must be reset at the end of the installation. The installation would otherwise start from the beginning again the next time the system starts. installation_​feedback_host If univention-net-installer-daemon has been setup to reset the (Re-)install on next boot option in the Univention Management Console (see Section 1.4.1), this variable specifies the IP address of the host where the daemon is running. installation_​feedback_port If the daemon for resetting the (Re-)install on next boot flag has been configured (see profile variable installation_feedback_host), this variable can be used to specify the port where the daemon is listening for connections. This variable only needs to be configured if the daemon is running on a non-default port. If unset, 49173 is used. The following profile variables can be used to specify basic properties of the computer such as the computer name, its role within the UCS domain and the name of the domain the computer should join. system_role The system role. You may choose from domaincontroller_master, domaincontroller_backup, domaincontroller_slave, memberserver and base. The properties of the system roles are described in the domain services chapter of the UCS manual [ucs-handbuch]. hostname The computer name. The name must only contain the letters a to z in lowercase, the figures 0 to 9 and hyphens. Although underscore are allowed as well, they should not be used as they are not supported everywhere. The name must begin with a letter. domainname The name of the DNS domain in which the computer is joined. fqdn This value only has informative character. It is calculated by concatenating the values of the variables hostname and domainname. windows_domain The name of the NetBIOS domain used by Samba. This variable should only by defined for the system role master domain controller. locales Localisation packages to be installed (locales). If more than one locale is specified, the locales are separated by blank spaces. locale_default The standard locale for the computer, e.g. en_GB.UTF-8:UTF-8. More information on system locales can be found at [locales]. country, keymap The keyboard layout for the computer, specified in the form of an X11 keymap entry, e.g. de-latin1. timezone The time zone for the computer, e.g. Europe/Berlin. A complete list of possible configuration options is shown in the Basic settings module of the Univention Management Console. root_password The password for the root user for this computer. On a master domain controller, this password is also used for the Administrator's password. use_efi Whether a system is using the Unified Extensible Firmware Interface (UEFI) boot mechanism is detected automatically. This variable can be used to override the automatic detection. Possible values are yes and no. The entries domain_controller_account and domain_controller_password are essential for computers intended to join the domain. auto_join As standard, all computers apart from the base system and master domain controller attempt to join the UCS domain in the course of the installation. If this parameter is set to false, the automatic domain join is deactivated. domain_controller_​account The name of a user authorised to perform the computer's domain join. In the standard setting this is the user Administrator. The entry is essential on systems intended to join the UCS domain. domain_controller_​password The password for the domain_controller_account. The entry is essential on systems intended to join the UCS domain. ldap_base The base DN of the LDAP domain. In general, the base DN dc=company,dc=example is used in a domain company.example. This variable is only evaluated on the system role master domain controller. ldap_position The position as DN in the LDAP directory at which the computer object should be saved when joining the domain. If this variable is not set, the object is saved in the standard container for computers with its system role. call_master_joinscripts If set to false, the join-scripts are not executed on the system role master domain controller. This is only required for special situations like setting up UCS systems in Appliance mode. The following profile variables can be used to specify the network configuration of the computer. There is a restriction on the number of network cards used. A maximum of four physical network cards can be used with four virtual interfaces for each physical one. General information on the network configuration and the use of the name servers can be found in Chapter Network configuration of the UCS manual [ucs-handbuch]. The use_external_nameserver parameter can be used to suppress the use of the local name server. The external name server must be specified in the profile with the nameserver_1 parameter. The settings for network cards must be performed completely. It is not possible to leave individual settings blank. For example, if there is no IP address for the device eth0 in the profile, in addition to the IP address, the eth0_netmask will also be requested. ethN_type If this parameter is set to dynamic or dhcp, the network interface ethN procures its network configuration via DHCP. The settings of ethN_ip, ethN_netmask, ethN_network, ethN_broadcast, nameserver_N and gateway then become optional, but can still be used to over-write the configuration provided by DHCP. If no DHCP offer is received, a random IP address from the link-local network 169.254.x.x is used. ethN_ip The IPv4 address of the physical network interface ethN. ethN_netmask The network mask of the subnetwork from which the IPv4 address of ethN originates. gateway The IPv4 address of the gateway which the computer should use as standard. Alternatively, one can specify the computer name or the FQDN that can be resolved into the IP address. ethN_ip6 The IPv6 address of the physical network interface ethN in static configuration. ethN_prefix6 The prefix of the IPv6 address of the physical network interface ethN in static configuration. gateway6 The IPv6 address of the gateway which the computer should use as standard. It is not obligatory to enter a gateway for IPv6, but recommended. An IPv6 gateway configured here has preference over router advertisements, which might otherwise be able to change the route. ethN_acceptra If this setting is set to yes, the stateless address auto-configuration (SLAAC) is used. In this, the IP address is assigned from the routers of the local network segment. If the variable is set to no, the configuration is performed statically via ethN_ip6 and ethN_prefix6 (see below). use_external_nameserver If this parameter is set to true, the DNS service automatically installed on every domain controller is not used. Instead, the variable nameserver_N is used to specify an external name server. If the parameter is set to false or not set at all, the internal name server will be used in accordance with the UCS standard. nameserver_1, nameserver_2, nameserver_3 The IP address of the name server which should perform the name resolution. It is possible to specify up to three name servers. dns_forwarder_1, dns_forwarder_2, dns_forwarder_3 The IP address of the name server intended to serve as the forwarder for a locally installed DNS service. It is possible to specify up to three forwarders. proxy_http The URL of a proxy server to be used when downloading accessing the Internet. The specified URL is adopted in the Univention Configuration Registry variables proxy/http and proxy/ftp. This setting is only required if packages are to be installed which download additional packages from external web servers; e.g., the installation program for the Flash plugin. The following profile variables refer to software packages which are to be installed on the computer. packages Each system role has a preselection of software which is installed on the system. This settings names packages which are additionally installed. If more than one package is specified, the packages are separated by blank spaces. local_repository (Unused since UCS-3.0) If this parameter is set to true, a local repository is set up and the contents of the installation DVD copied (see Chapter Software deployment of the UCS manual [ucs-handbuch]. The configuration of the partition settings can be performed completely profiled-based. Existing partitions can be deleted or mounted as data partitions without reformatting; new partitions can be set up in free areas. In contrast to the remaining variables, the profile variables for hard drive configuration have an extended syntax. part_delete causes deletion of partitions; lvmlv_delete can be used to delete LVM logical volumes. The profile variable auto_part activates the automatic partitioning. The profile variable dev_Number specifies whether and how the partition should be formatted and where the partition should be mounted in the file system. The names used for the profile variable must be furnished with running numbers starting with zero (dev_0, dev_1, dev_2, ...) The profile variable for the configuration of the partitions has the most extensive syntax. The entry type, device file, partition type, partition format, file system, start and end cylinder of the partition, directory under which the partition should be mounted and additional options parameters must be specified. The first parameter describes the entry type. A difference is made here between PHY for a physical partition and LVM for a LVM logical volume entry. As a second parameter, the device name of the partition (e.g., /dev/sda1) or the logical volume (e.g., /dev/vg_ucs/log_vol_1) must be entered. The third parameter describes the partition type. For PHY entries, 0 means primary, 1 means logical and 2 means extended. For LVM entries, only the value LVMLV for a LVM logical volume is currently recognised. The fourth parameter determines whether the partition is formatted during the installation (value 1) or not (value 0). Extended partitions are assigned the value 0. If you do not want to format an existing partition, alternatively, the parameter only_mount can be set on the third position and 0 can be set in the fourth position. The fifth parameter describes the file system to be used. You can choose between ext2, ext3, ext4, linux-swap None (for extended partitions and partitions to which no file system is to be ordered) and xfs. Parameters six and seven describe the start and end cylinders of the partition. If 0 is entered as the end cylinder, the partition is set from the specified start cylinder to the end of the hard drive. The start and end points of the partition can also be specified in kilobytes/1024 bytes (k or K), megabytes/1048576 bytes (m or M) and gigabytes/1073741824 bytes (g or G). The end can be specified relative to the start point (e.g., `10g +2g'). Bytes and cylinder specifications can be mixed (e.g., `12g 0' for a partition beginning at 12 gigabytes and ending with the last cylinder). For an LVM entry, the start point should always be set as 0 and its end point should be set to the required size of the LVM logical volume. dev_1="PHY /dev/sda1 0 1 ext3 0.032256M 106.928128M /boot None"
dev_0="LVM /dev/vg_ucs/rootfs LVMLV 1 ext3 0.0M 4000M / None"
dev_4="LVM /dev/vg_ucs/vol2 LVMLV 1 ext3 0 4000M None None"
dev_3="PHY /dev/sda3 0 0 None 633.34656M 0 None lvm"
dev_2="PHY /dev/sda2 0 1 linux-swap 106.92864M 633.346048M None None"
The eighth parameter stands for the mount point. For swap partitions and other partitions without a mount point None should be entered. lvm can be entered as the ninth parameter to mark the partition as a LVM physical disk. In all other cases, None should be entered. part_delete The names of the partitions to be deleted during the installation. The name used by the operating system (e.g., /dev/sda4) should be entered here. In addition, the value all is supported, which causes the deletion of all the partitions on all detected hard drives. lvm_delete The names of the logical volumes to be deleted during the installation. Two different spellings can be used in the entry. The first is to specify the full device file name (e.g., /dev/vg_ucs/rootfs) or just the combination of LVM volume group and LVM logical volume (e.g., vg_ucs/rootfs). The second is to delete all LVM logical volumes from an LVM volume group by specifying the LVM volume group (e.g., /dev/vg_ucs/* or vg_ucs). dev_N Information on the partitions in the order entry type, device file, partition type, formatting yes/no, file system, start and end point, mount point, additional options. partitiontable_type This variable is used to specify the type of the partition table to create. If this variable is set to gpt, the partitioning is performed using the GUID Partition Table standard (GPT). If configured to mbr or msdos, a master boot record (MBR) is used (this is deprecated since UCS-3.0). The default is still mbr. create_partitiontable This variable can be used to specify a space separated list of devices on which a partition table should be created. Unpartitioned disks can not be used for installations and are ignored, which causes auto-partition to fail. All non-USB disks are partitioned and used to create one large logical volume spanning all disks. Only the first disk is partitioned and used to create one logical volume spanning only that disk. disks A space separated list of disk devices (e.g., /dev/sda) used for auto-partitioning. It is incaompatible with create_partitiontable, which superseeds this disks setting. A SSL certification infrastructure is set up during installation of a master domain controller. If no settings are configured, automatic names are given for the certificate. ssl_country The ISO country code of the certification body appearing in the certificate (root CA), specified with two capital letters. ssl_state The region, county or province that appears in the certificate of the root CA. ssl_locality Place appearing in the certificate of the root CA. ssl_organization Name of the organisation that appears in the certificate of the root CA. ssl_organizationalunit Name of the organisational unit or department of the organisation that appears in the certificate of the root CA. ssl_email E-mail address that appears in the certificate of the root CA. Network-based, profile-based installations via PXE are performed with the Univention Net Installer, which can be set up using the univention-net-installer package. In addition, a DHCP server is required. If the DHCP server and the PXE server of the Univention Net Installer are operated on separate systems, the PXE server must be assigned via a DHCP boot policy. Univention Net Installer supports both the interactive and profile-based installation. Univention Net Installer requires a local repository as a package source (see the software deployment chapter of the UCS manual [ucs-handbuch]). The profiles must be copied into the directory /var/lib/univention-repository/profiles/ on the repository server. The (Re-)install on next boot option must now be activated in the Advanced settings tab under Deployment. The name of the installation profile under /var/lib/univention-repository/profiles/ can be entered under Name of installation profile. The file name of the profile should be entered without specifying the path. Options entered under Additional start options are passed on to the kernel in network-based installations, e.g., for the deactivation of ACPI during system start. A profile-based installation is performed as standard in installations with the Univention Net Installer. If one wishes to perform an interactive installation instead, the Interactive installation option must be activated. If any installation profile is entered, then it is no longer used. A PXE configuration file is created for every computer object under /var/lib/univention-client-boot/. It must be verified that the boot order in BIOS of the system to be installed prefers a PXE network boot over hard disks or CD-ROMs. On the next restart of the computer it will boot via PXE and is installed via the network. If no profile has been specified, a list of existing profiles is shown at the beginning of the installation for selection. If the selected profile includes an error, meaning it can't be loaded, an error message is emitted. It is then possible to select another profile. User inputs are only required for profile-based installations if a profile password is specified in the profile or variables with to_check are explicitly entered for requests (see Section 1.3.1). If to_check is not used, a request may be given for essential variables with missing or erroneous values. By default the (Re-)install on next boot option needs to be reset manually after the installation has finished. If the package univention-net-installer-daemon is installed on the server, the flag can be reset automatically. The daemon needs to be configured in the installation profile using the variables installation_feedback_host and installation_feedback_port (see Section 1.3.1). If the univention-net-installer-daemon is not used, the option (Re-)install on next boot must be unset manually after the installation. Otherwise the computer will be reinstalled every time the host is booted! The installation profile can be stored on an adapted installation DVD. This is done by creating a copy of the DVD and storing the installation profile in the profiles/ directory. The installation profile can be stored in the root directory of a disk or a USB storage device (e.g., USB stick). First the Additional options option must be selected in the main menu of the Univention Installer and then the kernel to be used (e.g., Univention Installer Kernel 3.10.0) must be the selected in the following menu. If the installation profile was stored on the DVD, Univention Installer Profil must be selected; Univention Installer Profil USB or Univention Installer Profil Floppy must be selected if the files are to be procured from a USB stick or disk. 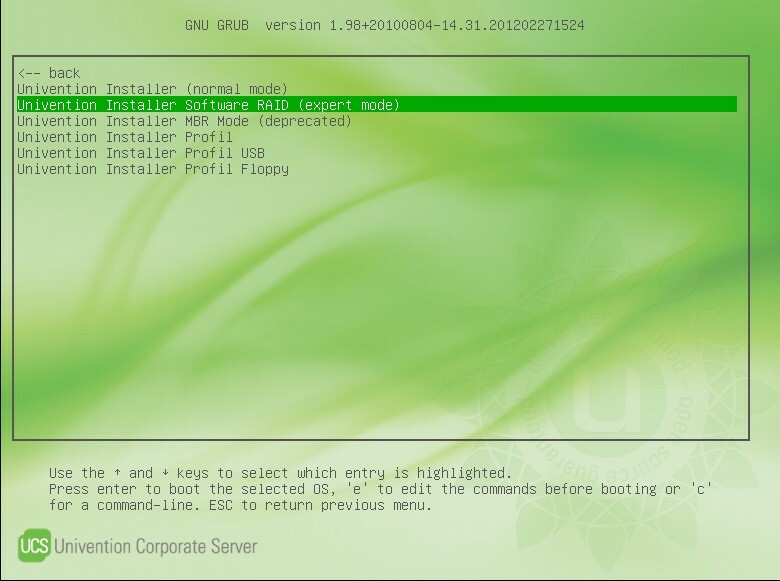 If Additional options -> Univention Installer Kernel [Version] -> Software RAID (expert mode) has been selected in the Univention Grub Boot Menu, the partitioning menu during the installation process is replaced with a command line shell, which allows arbitrary partitioning configuration. This mode can, for example, be used to set up a software RAID or an encrypted hard drive partition. After partitioning, the interactive installation is continued. Special Univention Configuration Registry variables with partitioning information must then be set. The installer evaluates these later and mounts the corresponding partitions during the installation. The NUMBER value at the third position in the variable's name increases for every device file to be mounted. The information for three partitions should thus be saved under installer/device/0, installer/device/1 and installer/device/2. The root partition, in other words the partition which will later be mounted under /, must always be configured under installer/device/0. Following disk partitioning, creation of filesystems and setting up the Univention Configuration Registry variables, the key combination Alt+F1 can be used to return to the installer and continue with the installation. A RAID (redundant array of independent disks) is used to increase data security and/or data throughput via the organisation of several hard drives in a logical drive. RAID is usually setup using a designated hardware RAID controller, but can also be implemented with a software-based setup. In Univention Corporate Server, software RAIDs can be created and managed with the mdadm program. At least two hard drive partitions (normally on different hard drives) are combined into one RAID device. This RAID device can be accessed, formatted and mounted via a device file like a normal partition. The kernel modules responsible for software RAID (raid0, raid1, raid10 and raid5) are included in the Linux kernel and loaded automatically. Start the installation in expert mode as described in Chapter 2. In this example it is assumed that two hard disks with identical sizes are present: /dev/sda and /dev/sdb. The following commands prepare the hard disks for RAID 1 by setting up 3 partitions. A small partition to hold the bootloader, a partition for /boot and the rest of the available space for a LVM which will hold the operating system. To prepare the second disk, each of the above commands has to be executed with the parameter /dev/sda changed to /dev/sdb. The next step is to setup the RAID 1 for the /boot partition and the LVM Partition. After the RAID 1 has been set up the devices have to sync. This takes some time depending on the disk size. The current status and remaining time can be checked with cat /proc/mdstat. Only after the devices are synced the filesystems can be setup. Before continuing the installation the following UCR variables have to be set to inform the installer about the partition layout. To continue the installation Alt+F1 has to be pressed to return to the menu. When asked where to install the Grub bootloader, /dev/sda should be selected. The configuration file /etc/mdadm/mdadm.conf contains general settings and a description of the RAID level and the partitions involved for every RAID. The RAIDs entered in this file (ARRAY) can be determined with the mdadm --detail --scan command. The daemon is configured in the /etc/default/mdadm file. The entry of AUTOSTART=true is important here to ensure that the RAIDs are automatically updated when the computer is started. The software package mdadm automatically detects all RAIDs during the installation and creates the configuration files /etc/mdadm/mdadm.conf and /etc/default/mdadm In other words, no additional adjustments to the RAID configuration files are necessary during the installation. Further information on software RAIDs and the partitioning on the command line can be found at the following URLs. [ucs-handbuch] Univention GmbH. 2014. Univention Corporate Server - Manual for users and administrators. http://docs.univention.de/manual-3.2.html. [locales] Debian Project. 2013. Locale - Debian Wiki. https://wiki.debian.org/Locale.